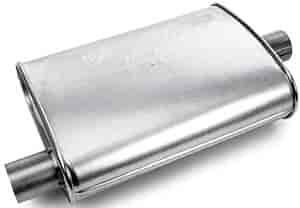 Dynomax Super Turbo Muffler In/Out: 3"
Body Diameter: 5.5" x 11"
17793 is rated 5.0 out of 5 by 1. Rated 5 out of 5 by Highwayman from Classy I ran a used 3” set on a BBC street truck for 20 years until the housing blew up. Since I have turned down exhaust in front of the axel I stayed with them this time and I enjoy the crisp quiet clean idle with minimal vibes. I can hear myself think while cruising with these.